UPDATED: January 8th, 2013 – This review has been updated to reflect the new Spinfuel Choice Awards! Several of Johnson Creek’s Smoke Juice flavors have earned across-the-board 5 Star ratings from the Spinfuel Review Team. As such, these flavors have each earned their own Choice Award. 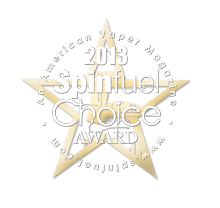 Read more about the Spinfuel Choice Awards Here. Every eCigarette user, reseller and manufacturer knows the Johnson Creek name. Its reputation is stellar, the quality is unsurpassed, and they are the “standard” by which all other juice companies aspire. To put it in the simplest terms, Johnson Creek is the premier American Made and American manufactured smoke juice company. To celebrate ‘July is e-Juice Month’ without writing about Johnson Creek would be like writing about the Founding Fathers of the United States and leaving out George Washington. Despite its position in the marketplace as the #1 e-liquid manufacturer, and despite being the e-liquid used in the creation of the entire range of prefilled cartomizers for Blu Cigs, Johnson Creek is still a young company. (Heck, the entire eCigarette industry is still in its infancy) With just a handful of dedicated and passionate people Johnson Creek is the most respected “juice” company in our industry. Johnson Creek set the standard in the smoke juice market by being the first to willingly publish their smoke juice ingredients online, to post the official analysis of their juice online, to dedicate themselves to using only the purest ingredients, to guarantee that you, the end-user, would be the first human to touch the juice they make, and thereby putting cross-contamination concerns to a rest. That’s just the beginning. Johnson Creek is an American Success Story, from beginning to end. Each juice is created in-house by their talented and dedicated team. Relentless testing, tweaking, and testing again, shows how much they care not only in each juice they create and release to their customers, but to the entire eCigarette industry and the millions of people worldwide that use their smoke juice. Currently, their Smoke Juice is available in 15ML and 30ML sizes, each come in an amber glass bottle. Sample sizes (3ML) are also available in their variety tins. PG is the ingredient in most eJuice recipes that produces vapor. Propylene Glycol is on the FDA’s list of substances generally recognized to be safe for human consumption. VG is a natural substance that produces more vapor than PG; it’s a little thicker, and tends to be a bit less sweet than PG. Johnson Creek offers two distinct lines of smoke juice. Their Original Line is a wonderful PG-based smoke juice, providing a tremendous amount of flavor, a great throat hit, and good vapor. The Johnson Creek Red Oak line is a VG-based smoke juice which provides a tremendous amount of vapor, sweet(er) flavors, and produces a juice that’s a bit thicker than PG-based juice. The majority of eCig users vape a mixture a PG and VG all the time without any ill effects. However, there are a small number of people that show slight reactions to PG-based juice. That being the case Johnson Creek has developed an entire line of “strictly VG” smoke juice that produces excellent flavors and thick and luscious clouds of vapor juice, albeit with a bit less throat hit. We here at Spinfuel eCigs Magazine have enjoyed both their Original and Red Oak line of smoke juice and find it difficult to choose between the two. If you are new to Johnson Creek Smoke Juice we highly recommend ordering a sample tin from each line (Original PG-based and Red Oak VG-based) so that you can sample both lines and discover which one if for you. Spiced Apple Cider: Lots of juice companies make an Apple flavored juice, some are successful, some are not. Johnson Creek is nearly perfect. Sweet apple flavors, a dash of cinnamon that you can actually taste, this smoke juice tells a story. It’s not Christmas in July or anything, but I’ll be damned if it didn’t remind me of Christmas every time I vape this. Jon Locke: This isn’t the only time I vaped Spiced Apple. It’s already in my rotation. So definitely 5 stars from me. This is a nice, sweet, apple flavored juice. Tennessee Cured: No doubt a less sweet tobacco flavor (less sweet than JC Original but a whole lot sweeter than the new Silverthorn) TN Cured a very rich, very deep smoky tobacco. One of my favorite JC flavors, just ask Wendy. 5 Stars easily. Lisa: If I was going to vape a tobacco flavored smoke juice it would be TN Cured (or Domestic). I guess I agree with most, a Smokey (there is no better word to describe it) flavor and very rich. 5 Stars for Smokey. Tom: I didn’t know you do half-stars! That changes things John. Okay, Vanilla. Way too sweet for me, but you’re right, its not a desert vape, its better. Because JC was wise enough to make this a vanilla-tobacco vape I’m going with 5 Stars too! Jon Locke: If you’re going to vape a menthol it should be something like this, if not this exactly. Arctic Menthol is a cool vape without being cough syrup sickly. 5 Stars for achievement! Lisa: 3 Stars Chelsey?! Espresso is brilliant! Rich coffee beans and a rich tobacco (I wonder which tobacco flavor they use) combine to make a smooth yet full flavored vape. 5 Stars for brilliance! Chelsey: Oh My God! So good! Chocolate, rich, so smooth. 5 Stars. More please! VG-based smoke juice produces a bit more vapor than a PG or PG-VG mix; it also eliminates the chance of a PG reaction. But VG juice has a little less sweetness, and a bit less throat hit. JC Red Oak is a huge seller though, because the flavors shine and the smoothness is there is spades. Jon Locke: Make it unanimous. This is great stuff. Who knew I would love watermelon and honeydew as much as I do in Solstice. 5 Stars! Chelsey: An excellent tropical blend. This is not Pina colada though. All the making for Pina colada is here, but the caramel flavor hurts the traditional Pina colada love. Still, a 5 Star blend. Chelsey: Wicked throat hit, very strong flavors, tons of vapor. Never vaped anything like this before. Not an all day vape because frankly, I would fall over dead over the power of this amazing blend. 5 Stars for bravery! Jon Locke: I expected to hate this. Clove? No thanks. But, when JC decided to even the clove out with a nice strong cinnamon kick it was a stroke of genius. I enjoyed Marcado a lot more than I thought possible. 5 Stars! Lisa: I love chocolate, how could I not love Swiss Dark Chocolate! I enjoyed this flavor a lot. So, 5 Stars without any doubt. Jon Locke: Almost too sweet but then at the last second JC pulls it back in. Dark chocolate with vanilla and caramel. What’s not to love? 5 Stars. Tundra: A very serious, powerful menthol blend that you will either love or hate. Very good vapor, throat hits too hard, some tobacco flavor showing through, and its menthol is not for everyone. 3 Stars for me, but 5 stars for pulling off the most powerful Menthol anywhere. Tom: Way too strong for me. Read the description by John. This just isn’t my cup of tea, or flavor to vape. I could not vape this for more than a couple of hours, and then only slightly during that 2-hour period. 2 Stars for me, 5 Stars for JC’s achievement. Tom: For a tobacco guy I will admit that Rainier has me. The best cherry flavored stuff I’ve had in forever. Amazing. 5 Stars. Lisa: I like a lot of JC flavors, and I’ve given 5 stars to many of them. But, with just too many hours in a day and only so much money that I am allowed to spend on my vaping hobby, there aren’t many I can afford to own. RAINIER will be one of those that I own. Now that I’ve had this, how can I not continue? 5 Stars! 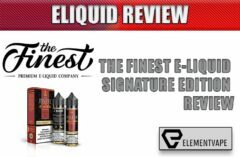 There is a reason why Johnson Creek is known as the #1 worldwide leader in eLiquids, or as they refer to their juice, Smoke Juice, and it clearly shows in the reviews above. Consistent quality, top-notch American sourced ingredients and a wonderful sense for creative flavors, these guys know how to make a thoroughly satisfying smoke juice for just about any situation. From an all-day vape to the occasional desert vape, these flavors will be some of the best you’ll ever taste. Lead Writer: John Manzione, Contributors: Tom McBride, Chelsey Laney, Lisa Johnston, Jon Locke. Previous : Johnson Creek Vea Review – Tips and Tricks!